A disturbing video has emerged of a priest slapping a baby across the face as he administers baptism. 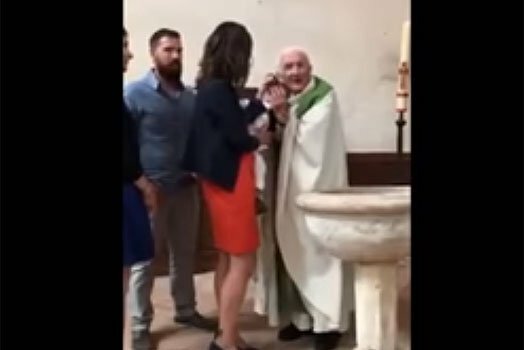 In a 40-second clip that has gone viral, the French-speaking clergyman lashes out in frustration during the ceremony as the tiny child is held by a woman thought to be his mother. The exact date of the incident are unclear, although the video surfaced on the internet on Wednesday. The footage depicts what looks like a standard christening with the priest trying to perform the religious ceremony on a crying baby. The priest initially attempts to console the infant by holding its head, but when that fails the priest appears to lose his temper and slaps the baby on the face.